Authors: Thomas --- Karbić, Damir. --- Matijević-Sokol, Mirjana. --- Sweeney, James Ross. Ever since Thomas' "Historia Salonitana" was first published in 1666, it became a part of the corpus of European medieval literature. 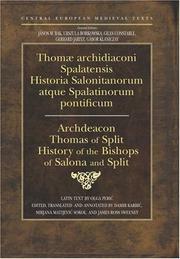 Thomas' aim was to write a history of the church of Split in order to prove that it was legally and justly the heir of the metropolitan rights of nearby Salona, an episcopal see from the 4th century. His reports on the fourth and fifth crusade and the Mongol invasion of 1241-2, are based on personal experience or on eyewitness reports.